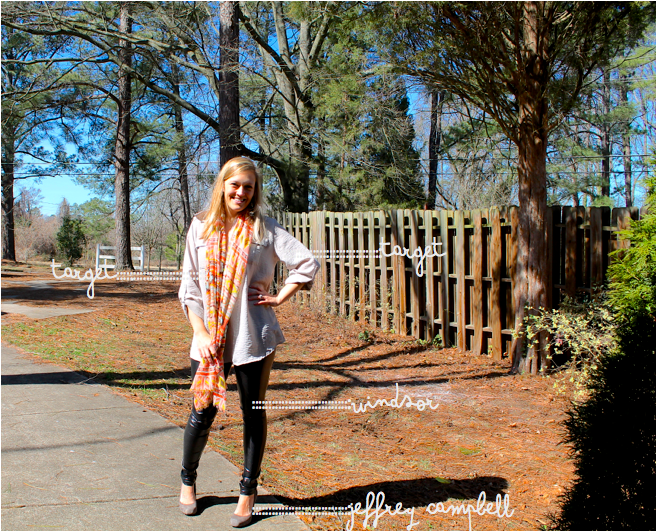 Skinny Jeans & a Chai Latte: Style files :: Liquid leggings. Shopping the closet is serious around here! I've had these liquid leggings for at least a year now and just wore them for the first time last week. This is the perfect long, loose shirt to wear with them too (because admittedly, they are very liquid and tight). I'm trying to find other ways to pair these, so I can break them out more! I actually wore this outfit last week to meet up with Justyn! I'm thrilled to have finally found an awesome blogger who actually lives near me! And I looooove this outfit! You rock those leggings like its your job girl! love the outfit! I didn't like the whole liquid leggings look until recently! (I've heard a bunch of people call them "wet look leggings"... that sounds weird to me lol) but now I definitely have to get a pair! WHAT WHAT WHAT YOU LOOK SO GOOD GURLL!! Gah. Gimme yo legs. You look so cute!! I love your liquid leggings. oh you!!! i looove this look. I am in loveeee with those leggings!!! I found my liquid leggings I bought years ago and recently started wearing them this year. I love pairing it up with a chambray shirt. cuuuute! love those leggings with your heels! Loving the leggings! I am always running out of great tops to wear with my leggings. I would wear them everyday otherwise! Cute blog! Ive been trying to find a pair for myself....i never knew they were called "liquid leggings". Thanks for letting me know! I think you styled them well. They look great on you, especially with the shoes! Girrrrrl - look at them leggins. I'm just glad you are team "Leggins are pants". Because lets be real, they totally are.